In observance of National Library Week, Alexandria Public Library is hosting FINE FREE WEEK April 8-13, 2019. During the week, any overdue or lost materials can be returned with fines waived. If you would like to pay off existing OVERDUE fines (not lost or damaged), please bring one canned or non-perishable food item for each dollar you owe for donation to the blessing box. We will not be able to accept any expired or damaged food items. For a little extra fun, don’t miss your chance to take a guess about how many biographies are in our collection each time you visit the library throughout the week! Help us kick off National Library Week. Join us for a book signing and author visit in the Warner Library at The Ohio State University at Newark/Central Ohio Technical College at 1219 University Drive, Newark. We still have a couple of free books available at our location and you may register for the event at our library. One Book, One Community is made possible through the Melissa Warner Bow endowed fund. Please call 740-924-3561 or email cstrong@alexandria.lib.oh.us to register. Books will be on sale the day of the event at the university. Don’t Throw Out Those Old Yearbooks! 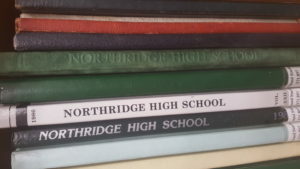 If you come across old Lickingana or Northridge Yearbooks when you are cleaning out, please don’t throw them away. They are great sources for genealogical research and general history of our community. 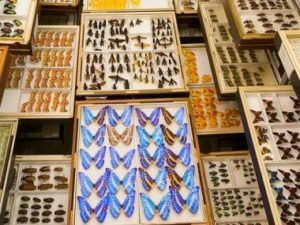 The library and museum are working on collecting a complete set of each. Also, we recently had a request from the Ohio Genealogical Society for any extra year books we might have, because they are trying to collect and preserve this precious historic resource for future generations. Just bring them to the Alexandria Library during regular business hours. The library and museum will keep one of each year and then the extras will be passed on to the OGS. Thank you for your help with this project. 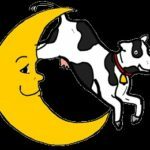 Nursery Rhymes for Spring Time! Join us for a story, snack, and craft. This month we will be reading I Wanna Go Home by Karen Kaufman Orloff and creating birdfeeders. 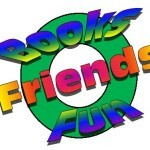 Space is limited for BFF and registration is required by 4:00PM Wednesday, April 10. Please call 740.924.3561 or email bbeck@alexandria.lib.oh.us for more information and to register for this month’s BFF. Please don’t forget to send a note to school giving permission for your child to walk over from school with our staff. Join us this month for a snack, story and activity as we learn all about bees. Students need to be registered by Wednesday, April 17 and a note will need to be sent to school giving the kids permission to walk from Northridge Primary to the library with our staff. Due to the school dismissal time for 4th and 5th graders, transportation arrangements will need to be made for them to attend the Licking Park District program. Please contact the library at 740.924.3561 or email bbeck@alexandria.lib.oh.us to register your student. This month we return to non-fiction with “Conan Doyle for the Defense” by Margalit Fox. We think the subtitle says it; “A true story of a sensational British murder, a quest for justice and the world’s most famous detective writer”. Come join us April 19th at 10:30 am for a lively discussion about a real case in which the writer of Sherlock Holmes uses his detective skills to exonerate a man wrongly convicted of murder. All adults are welcome to participate in monthly book discussions. For a morning of lively discussion call 740.924.3561, or email Martha at msturgill@alexandria.lib.oh.us or stop by the library to join Book Club. You need not be available every month to participate. If you would like to join us, please enter by the meeting room door as the library is closed on Fridays. Call 740-924-3561 or email cstrong@alexandria.lib.oh.us. Do you collect fossils, teapots, tractors or figurines? The sky is the limit. We are looking for collections to display in the library for a month at a time. If you have a collection and would be interested in sharing it with us we have just the case for you. Currently filling slots for 2020. Please contact the library at 740-924-3561 or email lmesser@alexandria.lib.oh.us. Have you seen our newest addition? 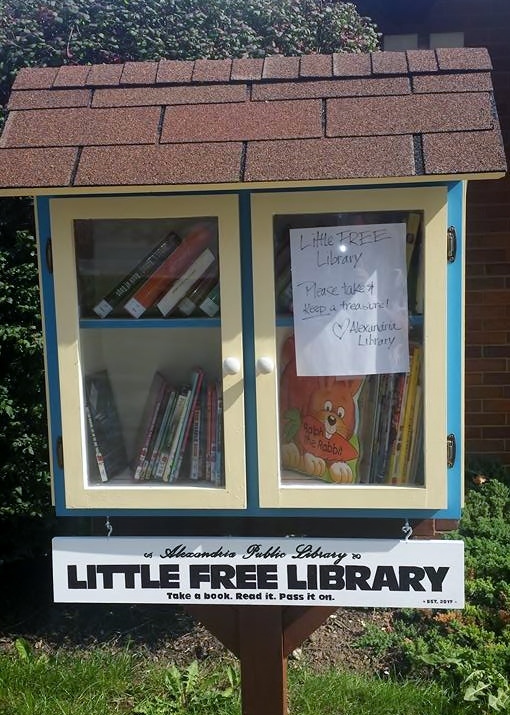 The Alexandria Public Library is very excited to announce the installation of an official Little Free Library. 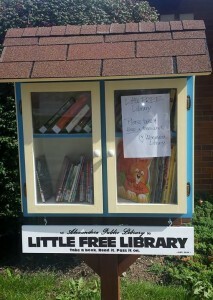 Built by local artist, David Tefft, the free library will be available 24/7 for anyone looking for a good read. Stocked with materials for readers of all ages! Thank you Mr. Tefft for this treasure! Our Friends are a group of interested patrons who plan programs for the library. They meet in June to plan programs for the year. The group helps with the book sales, Beggar’s Night, and adult-based programming throughout the year. Anyone is welcome to become a volunteer and help with the library activities. For more information, email Carrie at cstrong@alexandria.lib.oh.us, see any staff member, or download the Friends Member Form. 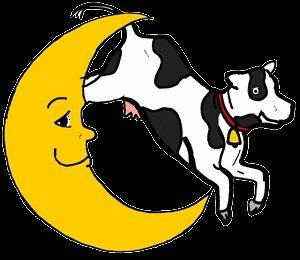 Kindergarteners through 5th graders are invited to the library for a chance to unwind after school with a snack, story and activity. Space is limited for BFF and registration is required by the 2nd Wednesday of each month. Please call 924.3561 or email to reserve a spot for your student. Mondays from 7:00-7:45; OR Thursdays from 10:00-10:45AM. Toddler Time (18-36 months old & caregiver) on Mondays from 6:30-6:50PM or Wednesdays from 10:00-10:20AM .